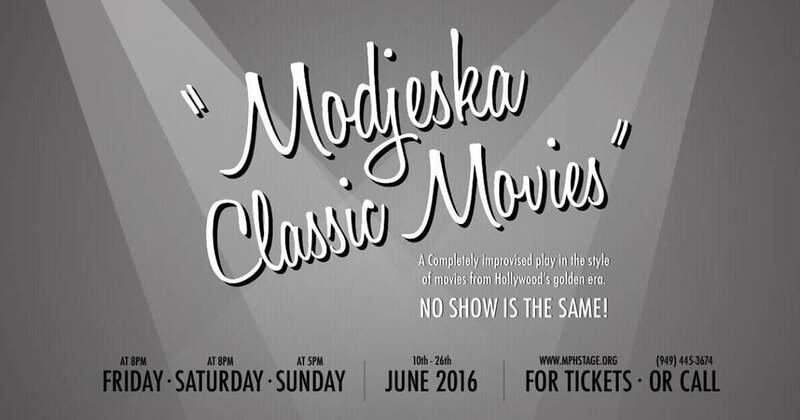 ‘Modjeska Classic Movies’ Opens June 10! Modjeska Playhouse is proud to present MODJESKA CLASSIC MOVIES! Imagine rummaging through the vaults of a long forgotten mid-century Hollywood studio to find a box full of never before seen movies from the 1940s and 50s. Well, that’s just what Modjeska Playhouse did… Sort of… Not really. Actually, Modjeska Classic Movies are nine completely improvised plays in the style of movies produced during Hollywood’s Golden Era! Based solely on suggestions from the audience, MPH’s Modjeska Improv Ensemble will create these feature length movies right before your eyes. Come see this hilarious “movie” that will only be performed once before it’s gone. Since no movie will ever be the same, come again and again!